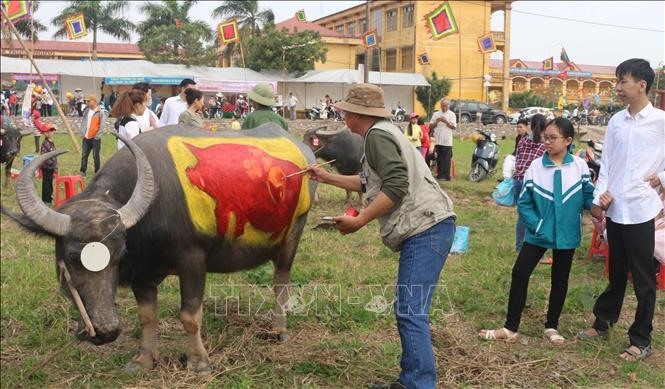 Colourful: Buffalo painting contest held in Ha Nam Province on Sunday. It attracted 24 painters. 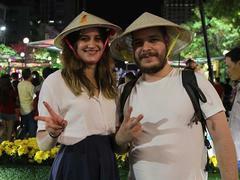 HA NOI — As the Lunar New Year begins, spring festivals countrywide are in full swing. Around 50,000 people made the pilgrimage to Huong Pagoda Complex for the Huong Pagoda Festival, which started on Sunday in My Duc District, Ha Noi. The three-month festival kicked-off with an artistic performance and a ceremony conducted by monks to pray for a year of peace and prosperity for the country and its people. Also in this festival, a photo exhibition and book featuring Huong Pagoda then and now were held. This book contains 155 black-and-white and coloured photos showcasing the beauty of the relic site over the last 90 years (from 1927 to 2018). This is one of the most celebrated festivals in Viet Nam with a huge number of pilgrims who visit the pagoda at the beginning of the year, wishing for a happy 12 months. The festival is an opportunity for the locals to commemorate the Bodhisattva Kwan Yin who, according to legend, reached enlightenment at Huong Pagoda. It attracts not only pilgrims but local and international visitors who seek a place of celestial beauty. The complex, recognised as the special national relic site, comprises of not only tranquil pagodas and shrines but also picturesque grotto. To reach the area, visitors take a boat ride on the scenic Yen Stream surrounded by rice paddies and a jagged limestone mountain range. Prior to the festival, Huong Pagoda Complex welcomed about 124,000 visitors from February 7 to 9, according to organisers. Deputy Chairman of My Duc District’s People’s Committee, also head of the organising team, Nguyen Van Hau said the local authority has mobilised staff to ensure the security and safety for the festival goers. About 190 security officers worked around the clock to handle the scammers, thieves and pickpockets. 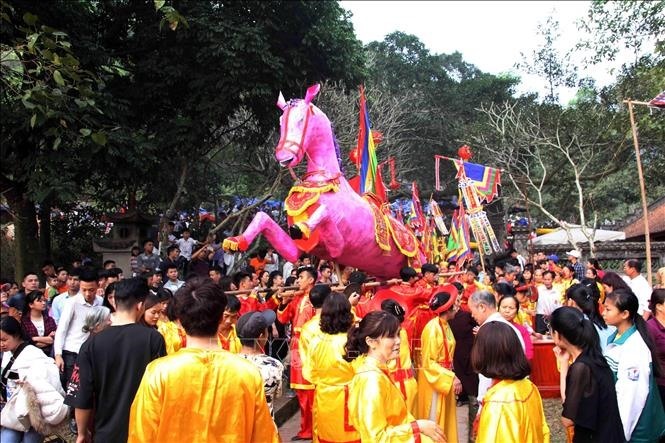 Also on Sunday, the Saint Giong Festival began in Soc Son District, Ha Noi, which aims to honour the legendary hero Giong, who is known as one of the Four Immortals of Viet Nam (along with Tan Vien - the God of the Mountain, Chu Dong Tu and the Mother Goddess Lieu Hanh). Legend has it Saint Giong was born after his mother walked in the footsteps of a giant. At the age of three, Giong suddenly transformed into a giant and fought against the foreign invaders. The king then presented Giong with an iron horse, which promptly chased the invaders out of the country. After triumphing, he and his horse went to Soc Mountain in Soc Son District. It is said that from the top of the mountain, he removed his armour and flew into the sky on his horse. Giong is also widely worshipped as ‘the patron god of the harvest, national peace and family prosperity’. This festival is considered a testament to the indomitable spirit of the nation when pitted against foreign invaders. Saint Giong Festival was recognised as a world intangible cultural heritage of humanity by UNESCO in 2010. About 80 km from Soc Son District is Ha Nam Province where the buffalo painting contest was held on Sunday. The contest is part of the Tich Dien (Ploughing) Festival which starts on Monday aiming to commemorate the God of Agriculture and to pray for a year of high yield season and prosperity. 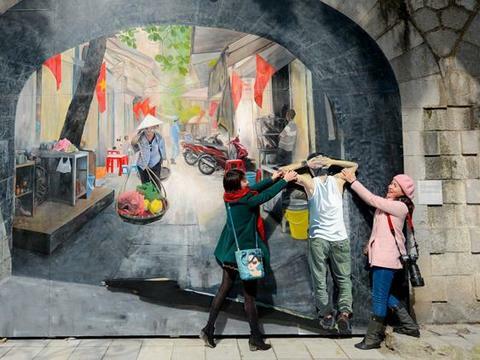 Twenty four painters from Ha Noi City and Ha Nam, Hung Yen, Ninh Binh and Thai Binh provinces and a Russian painter are taking part. Le Minh Son, chairman of the Ha Nam Art and Literature Association, said the traditional buffalo painting contest was revived in 2009. In the morning, buffaloes were brought to the stage area. The painters then gathered and used their creativity to paint on the body of the buffaloes. The winning buffaloes with the best patterns will be used to plough rice paddy fields at the Ploughing Festival. Boat trip: An estimate of 50,000 people participated in the launching ceremony of Huong Pagoda Festival on Sunday.